The project was designed and constructed to convey sanitary sewage from the Village of Ono in East Hanover Township to the Fort Indiantown Gap Wastewater Treatment Facility. As the appointed Engineer for East Hanover Township, Hanover Engineering provided professional services for all facets of the project, including Act 537 sewage planning, assistance in securing a $1,900,000 grant, negotiations with federal officials regarding treatment of wastewater, as well as design and construction observation services. The project was bid in early 2005 and was completed and placed into operation in the summer of 2007. The sewage system has a design flow of 40,000 gallons per day and is composed of a collection system, a pump station, and force main. The collection system consists of 8,525 linear feet of 8” PVC gravity piping and 1,870 linear feet of 2” low pressure sewer piping. The force main consists of approximately 9,000 linear feet of 6” high-density polyethylene pipe. Construction of the force main included two four-lane highway crossings, seven stream crossings, and a wide wetland crossing. Environmental impacts were minimized by using horizontal directional drilling for the environmentally sensitive crossings. The system’s pump station, designed to pump 100 gallons per minute with a total dynamic head of 114 feet, is a duplex submersible station with a precast concrete wet well. The station is provided with flow metering, corrosion control, and alarm equipment. 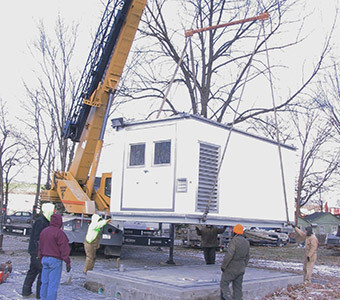 Emergency power is provided by an 85 KW propane fueled generator designed to provide 24 hours of emergency service.